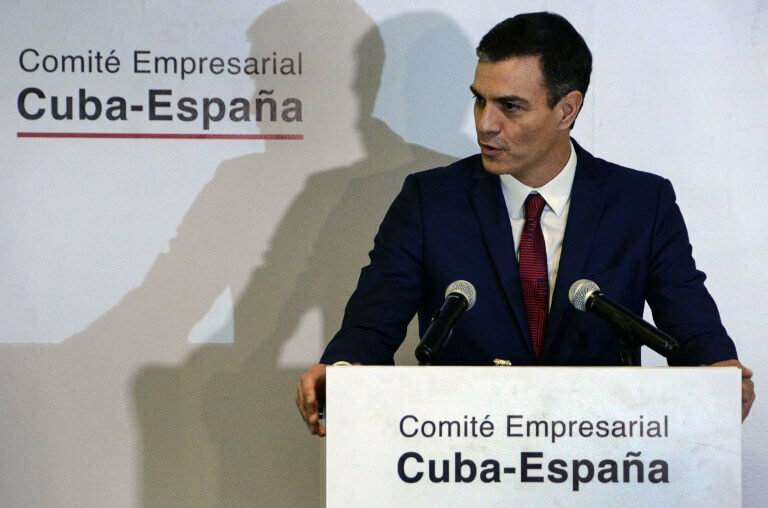 Spain’s Prime Minister Pedro Sánchez promised on Friday to continue investing in Cuba on the second day of his historic visit to the island nation, the first by a Spanish leader in 32 years. ‘The Spanish government will continue investing in Cuba,’ he said, while vowing to find ‘a solution to the problem of defaults’ faced by Spanish companies on the island. With trade worth $1.3 billion in 2017, Spain is Cuba’s third largest trading partner after China and Venezuela. The island nation is seeking closer ties with the European Union as its relationships with the United States and Brazil sour on the back of the elections of conservative leaders President Donald Trump and president-elect Jair Bolsonaro. Cuba’s President Miguel Diaz-Canel said on Twitter that ‘the relationship between Cuba and Spain is strengthening’ and added that his meeting with Sánchez on Thursday had been ‘friendly’. The two countries’ leaders have signed accords to establish bilateral consultations and cultural cooperation. Cuba has been badly hit by the economic meltdown in its socialist ally Venezuela, its primary source of fuel. Meanwhile, a spat with Brazil over a medical aid programme that has seen thousands of Cuban doctors head to the South American country to work could cost Havana $400 million in revenues, according to a diplomatic source. Cuba is in need of cash and in February will adopt a new constitution that should facilitate foreign investment. In Madrid, government spokeswoman Isabel Celaa told reporters the visit was ‘without a doubt one of the most important trips taken by the prime minister,’ and described Spain as a ‘bridge’ in Cuba-EU relations. She said the two leaders also spoke at length about climate change and renewable energy with a view to promoting investment in Cuba. As for the thorny issue of human rights, Celaa said they agreed to create a bilateral commission that would meet regularly.